1. Schedule outings around naptimes and bedtime – It’s real important to keep in mind your child’s sleep needs. Choose activities that work around your child’s sleep schedule. There is really no point in dragging your child to an activity during sleep time as they will not be able to enjoy it (nor will you) if they are overtired. RECIPE FOR A MELTDOWN. Not only will you all come out of the activity miserable and overtired, but your will be frustrated because now your child will not sleep even though they are clearly tired! Yes, an overtired baby is much more difficult to get to sleep – I’m sure many of you can attest to this! 2. Host Christmas activities in your home – When my children were younger, our house was a hub of activity. I hosted many holiday activities at my house, so my babies could have their own bed when it was their naptime or bedtime. This was a bit more work for me as I had to organize food and then spend time cleaning up afterwards, but so worth it because my babies were well rested and ready to party when they woke. It really was much more enjoyable all around, especially when your babies are under 2 years old, they just can’t manage without adequate sleep! 3. Have a good babysitter – Okay I am not saying that you have to miss the staff holiday party just because you have a baby! I certainly did not! BUT I did have a great babysitter who I trusted would follow the routine and sleep expectations to a tee. The key here is to have a babysitter that you trust or else there is no point going out because your thoughts and worries will just lead you back to what is happening at home. Also, have your babysitter come over several times before your night out so she can get used to the routine and your baby can get used to her. There’s nothing getting a call from a babysitter saying your baby has been crying for hours – Yikes, that’ll dampen your party mood REAL quick. 4. Take a piece of home with you when travelling – If your baby has a favourite stuffy or special blanket that he/she uses to self soothe to sleep, bring it along so the transition to a new sleep environment will be easier for your baby. I always encourage parent to have a travel with a play and pack, so their baby identifies that as being his/her travel bed. Try to be consistent with the routine even when travelling. 5. Get back to routine as soon as possible – It’s bound to happen, your plans may lead you to veer away from your routine now and then, it happens to all of us despite our best intentions especially when travelling and we have no control of flight times and delays etc. But try to keep these to a minimum, especially for the under 2 age group as stated earlier. Most importantly, get back to routine and consistency as quickly as possible. I hope these holiday sleep tips will help in making your holiday super fantastic. 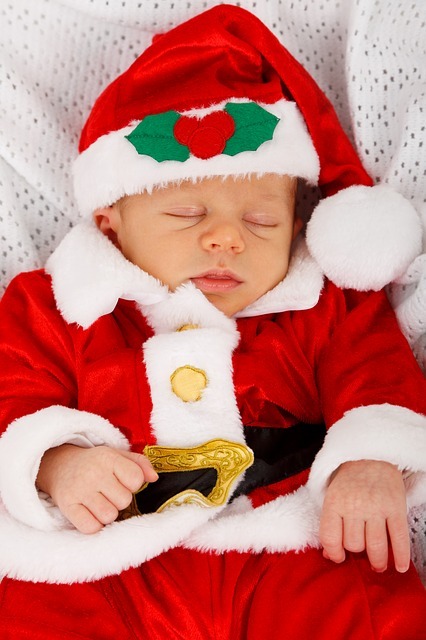 All the best during the holiday season and always make sleep a priority – it’s vital to our health!